The latest gizmo in the Sharper Image catalog is a sleek, portable, wireless writing device. The catalog promises "no compatibility issues with word documents or printers." And you can use it to "Jot a quick letter, address an envelope, or write the next great American novel..."
Best yet, it looks just like an old-fashioned manual typewriter. How nifty is that? Wait. It is a manual typewriter. I guess everything old really is new again. 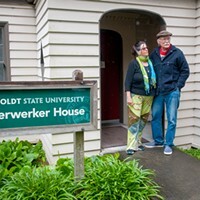 Last week, students at Humboldt State University handed out transistor radios, those portable, wireless listening devices with an antenna and dial that you keep on hand in case of an earthquake. Student Alex Fest had hunted them down in thrift stores to be used for the kickoff of student radio station KRFH on the local airwaves for the first time. I dusted off a radio I had in my garage. I listen to KRFH when I tackle tedious tasks but, until now, I had to first log onto my computer, pull up KRFH.net, hit Listen Live! and wait for it to connect to my iTunes. Now I just have to hit the on button on my radio. No password needed. How nifty is that? We owe KRFH to the great Dr. Gary Melton, whom I had the pleasure of knowing for a short time when I joined the HSU journalism department a decade ago, shortly before he died. Gary was a true believer in students, in music and in radio. 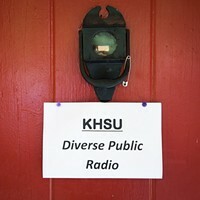 To listen to KRFH, you had to literally be plugged into the school — the signal carried through the electrical currents in the dorms, or you had to be in the student Depot, where the managers played the station over the speakers, except for when they didn't like the music or the DJs pissed them off. Then it went Internet, which gave the DJs the potential of speaking to the world. Mostly, the DJs spun discs in the sound booth to a handful of online listeners. Gary's spirit lives on in KRFH. I call it our cult. The students don't get paid and the class doesn't count towards the major, yet some 80 students sign up for it each year and keep it going 24 hours a day. The journey of KRFH from the Internet to the radio waves took less than a year, a miracle in the world of university and federal government bureaucracy. Alex Fest came to me last spring with the news that a change in federal law made the school eligible for a low power radio signal that could broadcast KRFH from Trinidad to Eureka. It would take almost $20,000 to build. We would need university approval. KHSU could block our bid. And we had to have it in operation within a year or we'd lose the opportunity. Getting that signal was a pipe dream. Then the craziest thing happened. Everyone fell in love with the idea. KHSU General Manager Ed Subkis said he'd support it. Dean Ken Ayoob and the university administration found us the money. Fest and KRFH adviser Cliff Berkowitz (whose KSLG radio would seem to be the station in most direct competition with over-the-air student radio) sliced through all the bureaucratic channels with invisible scissors. If this were a movie, you would see Gary's ghost appearing here and there, waving magic fingers. For those of us who love radio, Humboldt County now feels complete. KRFH snuggles between the calm of KHSU and the consistency of KHUM. It offers no competitive threat to either. You have to be a certain type to like college radio. It is raw. The DJs change every term, so, just as you get used to one, she disappears. They have unpredictable tastes. I tune in expecting ear-splitting music and get old jazz. Then someone spins Swedish death metal. They play whatever they want because they can, within general FCC guidelines. There is no boss. They live in the bubble of true First Amendment, uncensored by the government, corporate world, their professors or the university administration. I tell my students on the Lumberjack newspaper: Be bold. Take risks. Do it now, because in the professional world you won't have that freedom. Given that freedom, it is amazing the level of professionalism the students show. 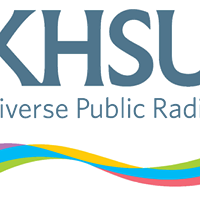 KRFH puts out local news reports daily and has done that for years over its Internet station. It takes three students to put out each broadcast — an anchor, a reporter and a producer. It may not be slick, but it isn't goofy. These students take their unpaid jobs seriously. On 105.1, you will be able to tune into these broadcasts at noon, 3:30 p.m., 5 p.m. and 6:30 p.m. from your car each day while school's in session. Two weeks ago we received the news that a bus carrying high school students to HSU crashed on Interstate 5 on the way to Spring Preview. Students from the Lumberjack newspaper mobilized that night. They reported for five days straight, overcoming obstacles the administration set up in an ostensible attempt to shield already traumatized prospective students. Through networking friends of friends of friends and through social media, Lumberjack reporters tracked down people who'd been on the bus, who'd missed the bus, who saw the crash. They talked to friends of the victims and others affected. They put out a story package that rivaled anything the San Francisco Chronicle could have done. They did it with sensitivity and professionalism, without pay and with hardly any sleep. That's student media. So in the next few weeks, check it all out. You'll soon find our Osprey magazines in local coffee shops. You can get the Lumberjack at the Co-op and Wildberries now, and KRFH is on your dial. Student journalists and broadcasters are nifty. They are wireless, portable and run on pure passion. You just have to turn them on. Marcy Burstiner is chair of the Department of Journalism and Mass Communication at Humboldt State University. She runs on coffee.